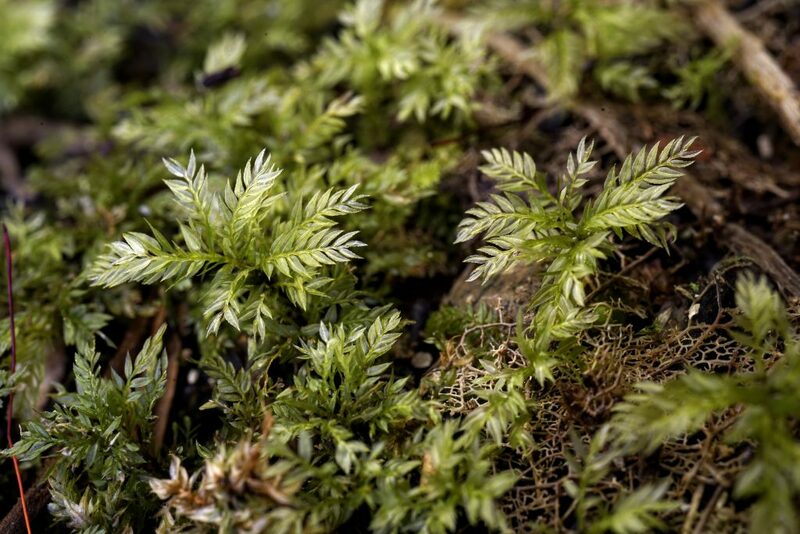 New Zealand – ferns the size of trees and (see below) mosses the size of…. very small trees. I’m just back from field work in New Zealand with Yoan Coudert, a French CNRS funded researcher based at the Ecole Normale Supérieure in Lyon. A major objective of the trip was to collect living material of selected moss species from groups that are now only found in the southern hemisphere, in the cool temperate rainforests of southern South America and Australasia and in the high altitude cloud forests of tropical Southeast Asia. These groups belong to the highly diverse lineage in which most mosses that have complex branching forms occur (the pleurocarps), but diverged from it early in its evolutionary history. Through experimenting with these plants in the lab, Yoan hopes to understand more about how complex branching evolved in mosses and how it differs from superficially similar forms found in vascular plants. Many of these mosses have what is termed a “dendroid” architecture – in other words, they resemble miniature trees with a trunk-like “stipe” supporting a closely-spaced cluster of tiny branches. Such forms are unusually common in New Zealand bryophytes (in liverworts as well as in mosses), and are particularly challenging to explain developmentally. 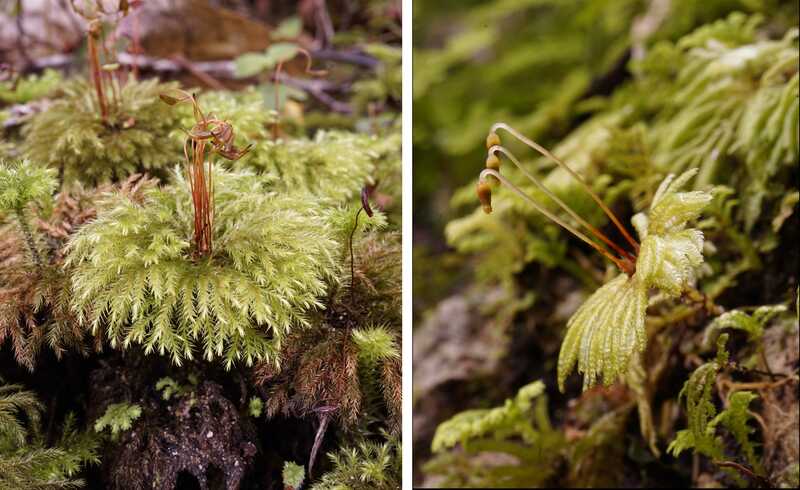 Mniodendron comatum (left) and Hypoterygium didictyon (right), two typical dendroid (tree-like) mosses found in temperate rainforest in New Zealand. While most dendroid mosses are large or very large (for mosses), like Mniodendron comatum and Hypopterygium didictyon pictured above, one species we were particularly interested in collecting, Hymenodontopsis bifaria, is rather small and exhibits the dendroid architecture in its simplest form, as well as representing one of the oldest pleurocarpous lineages in which such branching types occur. As such, it might be the ideal model organism or “lab rat” for investigating the evolutionary development of this type of architecture, as it should be relatively easy to cultivate in vitro and would be expected to have a fairly short generation time. Hymenodontopsis bifaria (≡Pyrrhobryum bifarium), one of the smallest and simplest dendroid mosses in which this type of architecture is likely to be homologous with that found in many of the larger dendroid species. Yoan has worked extensively with computer modelling of branching in Physcomitrella, the original moss model organism in which only very simple branching occurs (Coudert et al., 2015), and we recently collaborated on a study to define and reconstruct ancestral character states associated with branching in pleurocarpous mosses (Coudert et al., 2017). Yoan’s next step will be to attempt to put these two strands together to accurately model more complex branching and to explain how it is controlled genetically. It’s worth noting the very high levels of generic endemism in New Zealand mosses. 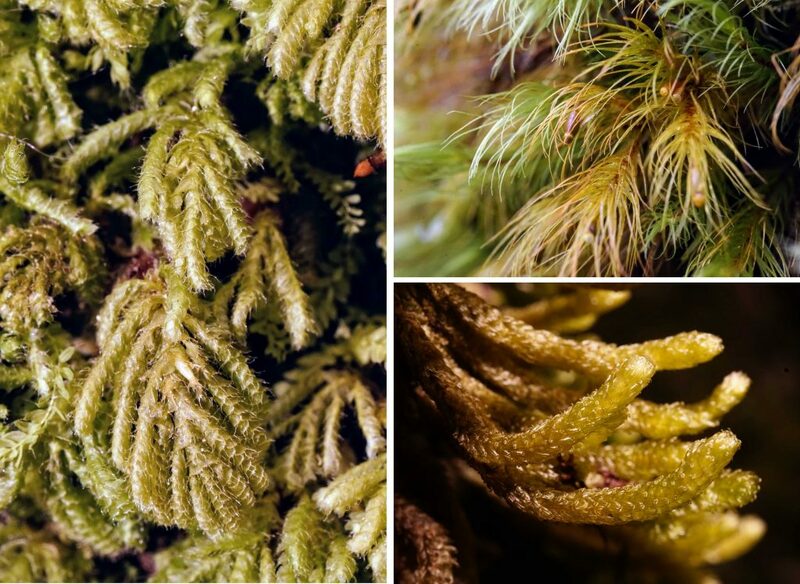 Endemism in general tends to be lower in bryophytes than in other land plant groups due to their dispersal capabilities, nonetheless there are at least 11 genera of mosses that are only found in New Zealand, an extraordinarily high number. Molecular studies have tended to support the phylogenetic distinctiveness of these endemics, suggesting that they are genuine relicts. Three endemic, monotypic moss genera from New Zealand. Catharomnion ciliatum (left), Cryptopodium bartramioides (top right) and Cladomnion ericoides (bottom right). There are at least eight more! Coudert Y, Palubicki W, Ljung K, Novak O, Leyser O & Harrison CJ (2015). . eLIFE, 10.7554/eLife.06808. Coudert Y, Bell NE, Edelin C & Harrison CJ (2017). Multiple innovations underpinned branching form diversification in mosses. New Phytologist, 10.1111/nph.14553.